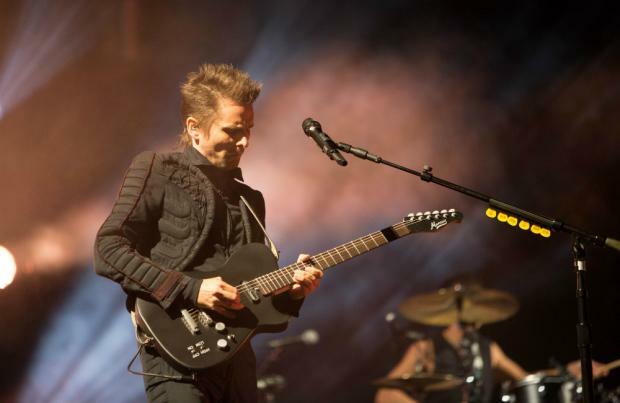 Matt Bellamy referenced 'Harry Potter' on Muse's new album to "troll" his bandmates. The 'Propaganda' musician has revealed the song includes a lyric – "You ate my soul just like a death eater" – as a nod to the wizard saga, but admitted bassist Chris Wolstenholme and drummer Dominic Howard aren't fans of the franchise. He told the Daily Star newspaper: "Hardly anyone has noticed. Dom who hates that universe, doesn't know! I love it. I treated it as a way of trolling Chris and Dom a bit." The line references the villainous and loyal followers of evil wizard Lord Voldemort – played by Ralph Fiennes on the big screen – and Matt has explained despite new album 'Simulation Theory' paying tribute to the 80s and sci-fi, he wanted something for the younger generation to relate to. He said: "It was to recognise the generation who grew up with 'Harry Potter', and the fantastic and magical things that have been a bit lost these last few years. "When we were kids in the 80s science fiction and fantasy was well represented. So to incorporate references to 'Harry Potter' seemed coherent with the themes of the album." Meanwhile, Chris has acknowledged the importance of nostalgia, and how important films can be in shaping people's childhoods and influences, including music. He added: "Maybe it's because we're entering our forties that we are looking back a bit. "Watching your children grow up makes you look at your own childhood a bit and what interested us then. My oldest memories are from films of that era."